The addictive game’s enhanced website adds exciting new game features and unlimited play; apps now available for iPhone, iPad, and iPod Touch. When players visit the freshly redesigned puzzle screen, they will encounter a variety of new features that enhance the play experience. These include solution reveal and advanced “drag-and-drop” note-taking capability. Experienced players will be especially pleased with the new option to customize their KenKen® puzzles. 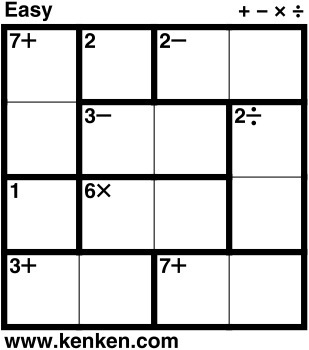 Players can now select the grid size (from 3x3 up to 9x9), math operations, and challenge level. “Puzzle customization allows players to gradually ramp up the game’s difficulty as their skill level improves,” said Robert Fuhrer, president of the KenKen Puzzle Co.
KenKen® Puzzle Co. promises that more new features, including puzzle save and resume, will be added soon. They encourage players to “like” their Facebook page (https://www.facebook.com/KenKenPuzzles) for the latest updates.